I must agree with Suzanne! 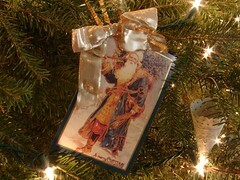 I love the idea with Christmas cards, especially the tree ornaments! I love ornaments and I keep track of every one seperatly stored in a plastic zip bag with who gave it and what year so many years down the road I will always cherish it. Now I have something to do with those really special cards that I get and don’t want to throw away!!! Keep on bringing the ideas Pastor Pearl!